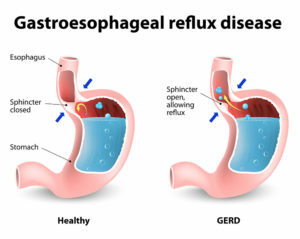 Acid reflux, also called Gastroesophageal Reflux Disease or GORD or GERD, is a common problem.In the UK approximately 30% of the population suffer from symptoms of gastroesophageal reflux disease and a quarter of these seek medical help. Over 1 1/2 million people require long term medication including powerful antacid proton pump inhibitor drugs. It is caused by the backflow of liquid from your stomach into your oesophagus (gullet). The stomach makes acid for digestion, but the lining of the lining of the oesophagus is not built to tolerate acid. There are many causes and contributing factors. The lower end of your oesophagus (gullet) has a natural barrier or valve (called the lower oesophageal sphincter) to prevent the backflow of acid from the stomach. Excessive stomach acid can enter your oesophagus if the valve does not work properly. The contributing factors which make this condition worse are hiatus hernia, obesity, smoking, excessive alcohol, stress and abnormal eating pattern. Persistent heartburn and acid regurgitation into throat and mouth. Usually worse after eating, when bending over or lying down- volume reflux. Hoarseness of voice, cough, especially in the morning. The feeling of food getting stuck in the throat leading to a choking sensation. Tooth decay, gum disease or unpleasant taste in mouth and bad breath. In more serious cases may cause oesophageal ulcers or bleeding. Asthma suffers may suffer worsening symptoms due to stomach acid irritating the airways. What are the complications of Acid Reflux? Acid reflux can cause inflammation and erosions in the inner lining of your oesophagus (gullet). This condition is called erosive oesophagitis. Because of the inflammation, your oesophagus can become narrow and you may get difficulty to swallow. This is called stricture or stenosis of the oesophagus. Long standing reflux can cause a condition called Barrett’s oesophagus. Repeated reflux can lead to changes in the cells that line the lower oesophagus. It is estimated that 1 in 10 people with GORD will develop Barrett’s oesophagus. Barrett’s oesophagus does not in itself cause any noticeable symptoms however there is a small risk that the cells affected by Barrett’s oesophagus may become cancerous and develop into oesophageal cancer. In patients that are diagnosed with Barrett’s oesophagus it may be recommended that they undertake regular endoscopies (every 2-3 years). Lifestyle modification. Healthy eating, weight loss, stop smoking and not eating for 3 hours before bedtime can be very helpful. Medications: Your doctor may prescribe some medicines called Proton Pump Inhibitors or PPIs, like omeprazole, lansoprazole, esomeprazole or pantoprazole. These drugs reduce the secretion of acid from the lining of your stomach. PPI drugs can be given in different doses, according to the severity of your problem. Surgery: Laparoscopic antireflux procedure– For patients who do not wish to have long term medications, have refractory symptoms or are suffering side effects of medications, this is an appropriate procedure. The procedure is performed through keyhole approach and stay in the hospital is usually 1 – 2 days. An artificial valve is created by wrapping the stomach around the lower part of the gullet. RNY Gastric Bypass- This is an ideal procedure if reflux is associated with morbid obesity. Complications:Procedure is tolerated well, although patients can be on pureed diet for 6-8 weeks. Some patients develop temporary difficulty swallowing immediately after the operation. This usually resolves within one to three months after surgery. A sloppy diet may be required for this period. Occasionally, these patients may require a simple procedure to expand the oesophagus (endoscopic dilatation) or rarely re-operation (<1%). The ability to belch and or vomit may be limited following this procedure. Some patients complain of stomach bloating. Avoid fizzy drinks.